It would be helpful if local sign in allowed you to create a new user of any type and sign you into the appropriate application. This PR adds a drop down for the user type and then will create the appropriate associated models when it creates the user. Finally it will redirect to the appropriate site for that user type. The logic that creates a user will look in the request for data including First Name, Last Name, Phone Number, and Email. If any of those are present it will use those instead of defaults. (These extra ones were not added to the html form). This allows a regular POST request to /devlocal-auth/create to create a user of any type instead of having to do DB operations. In turn that provides a hook that means a Load Testing application can create these users at will. Finally, I've limited the page to returning only 25 users. Load testing has created 1000s of users and this page seems to take forever to load unless I have a limit. I'm not convinced we're ready for pagination so either 25 is good or a slightly higher number. But we can't do unlimited anymore. The change here got a little big because of the need to redirect to the correct application when a user was created of a type that is different than the application you start from. If there's a way to make this PR more readable I'm happy to do it. Run the server and the client, go to create a new devlocal user and select the type from the dropdown. Then submit the form to create a new user. Merging #1905 into master will decrease coverage by 0.27%. The diff coverage is 42.56%. 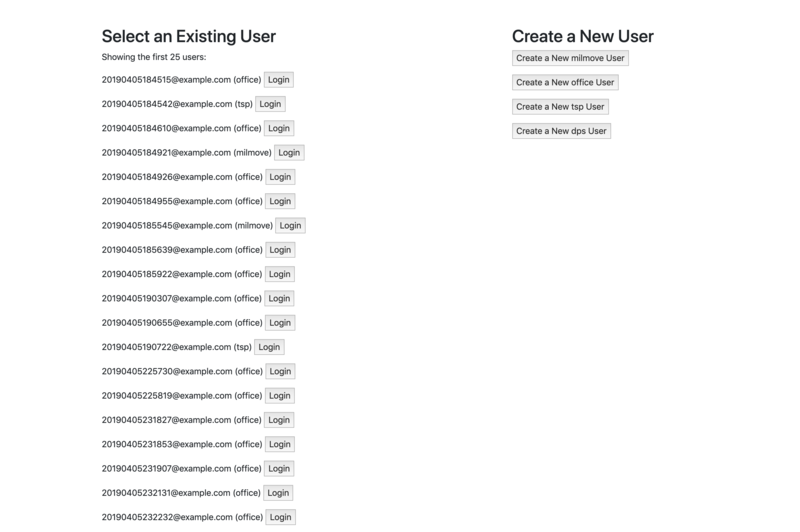 Clean up tests for logging in and creating a devlocal users. This looks pretty good to me, but how does this get us away from using the devlocal page to login for Cypress? I'll probably come back and fix this at some point, good call. It doesn't get us away from devlocal signin. It gets us away from using the devlocal signin page. So effectively this would get rid of cy.signInAsUser() and replace it with cy.signInAsUserPostRequest(), which is a direct POST. No longer would we need to use the button for the user we want to interact with. That should mean we don't need to worry about how cypress renders the devlocal signin page, and thus no need to modify the behavior of the cookies being generated for the forms there. FWIW, this PR also limits the number of returned users, which makes it mostly unusable for automated testing. Folks - I had a little trouble merging master in this morning and that added a few more bugs I had to fix. But this is Ready! Would really appreciate a review on this so I can get back to load testing. I'm going to try to fix the redirect with the suggestion from @stangah . If not then I'll probably split that into a separate PR and pull the changes from this PR. I don't need it but it sure was a nice convenience. Return the cookie so the Domain can be manipulated. So posting to the different subdomains doesn't work here because of CSRF protection. What I needed to do was set the Cookie Domain explicitly. I've done that but I'm afraid its a little odd how I've done it. I'll take another pass at this and try to clean it up. @lynzt - in my branch I ended up rewriting this to take advantage of constants.